CUBOT stands out for its innovative Phablets such as CUBOT POWER, which have attractive designs and excellent batteries, being incredibly durable and achieving great acceptance by the public and growth in the market around these last years, and today we invite you to know the new CUBOT P20 Phablet, with triple cameras, attractive design, 6.18 inch screen and much more! at an incredible price. 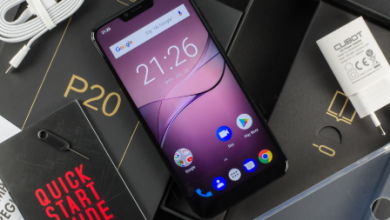 The packing of the CUBOT P20 Phablet has dimensions of 19.30 centimeters high, 14.50 centimeters long and 4.30 centimeters thick and has a weight of 472 grams. 1x User’s manual in English. 1x AC adapter: 100-240V 5V 2A. The CUBOT P20 Phablet has a size of 15.60 centimeters high, 7.52 centimeters long and 8.5 millimeters thick and a total weight of only 167 grams. Its ultra slim design provides an extremely comfortable driving feel, achieving a perfect contrast with the large 6.18 “screen. The CUBOT P20 Phablet is available in the market with attractive colors such as: black, black with gradient blue and black with gradient violet. The right side has the volume and lock control buttons, and on the left side, there is the Dual nano-SIM card slot. At the bottom is the charging hole and with the speakers on the sides of this, while on the top is located the 3.5mm port for the headphones. In the front, we have the attractive design of the Notch screen highlighting its front camera and in its back, we will find the dual cameras with the flash in the middle of them located vertically in the upper left corner of this profile, the fingerprint sensor, and the CUBOT logo are below them. Enjoy a wider view with the 6.18-inch U-shaped screen that has the CUBOT P20 Phablet, FHD + resolution of 2246 x 1080 pixels, with ultra-narrow Notch design and 19:9 aspect ratio. This will give you a visual experience that matches your needs. Lighter and thinner: the touch screen is not only more accurate, but it is thinner and lighter. Clear screen in the sun: the traditional touch screen is harder to see clearly in the sun, but the screen of the CUBOT P20 Phablet is very clear even in direct sunlight. The CUBOT P20 Phablet has two (2) powerful rear cameras of 20.0 MP + 2.0 MP, these cameras support the Bokeh algorithm, so they can achieve incredible Bokeh shots that rival the results of DSLR cameras. You can shoot first and focus later, transforming each photo into a memorable and artistic capture. It also has a front camera of 13.0 MP, with which you can take clear selfies, with style and with excellent quality, with the functions of “Smart Beauty“, brightness improvement, color intensity, clarity and dynamic range even in the darkest place it works well. Whenever you need it, your CUBOT P20 Phablet will be there, capturing great moments with crystal clear precision. The CUBOT P20 Phablet works with a MediaTek MT6750T processor with Octa-core at 1.5GHz high frequency. This has 4 GB of RAM and 64 GB in ROM capacity, in which you can store many FHD movies, images, and high-quality music, this hardware has a decent performance that gives you fluid and fast experience even in the most intense tasks. The memory can be extended up to 128GB through a TF/Micro SD card (not included). The CUBOT P20 Phablet has installed the original Android 8.0 Oreo system, an intelligent, fast and powerful operating system without bloatware or custom third-party layers on top. Keep your device safe in the easiest, most effective and most reliable way. Place your finger on the fingerprint unlocking module And that’s it! It’s that simple. The CUBOT P20 Phablet has a safe and fast unlocking sensor, which recognizes the fingerprints through the coating located on the back, the unlock time is only 0.1 seconds. It has the capacity to store up to 5 different fingerprints with a finger touch of 360 °. Network type: FDD-LTE, GSM, WCDMA. Wireless connectivity: 4G, A-GPS, Bluetooth 4.0, GPS, WiFi. 2G: GSM 850MHz, GSM 900MHz, 1800MHz, GSM 1900MHz. 3G: WCDMA B1 2100MHz, WCDMA B8 900MHz. 4G LTE: FDD B1 2100MHz, FDD B20 800MHz, FDD B3 1800MHz, FDD B7 2600MHz, FDD B8 900MHz. The CUBOT P20 Phablet is unlocked for worldwide use, however, you must make sure that the local area network is compatible. The CUBOT P20 Phablet has great power thanks to its non-removable high-density lithium-ion polymer battery of 4000mAh, the phone while not in use enters a long standby state, thus decreasing a significant expenditure of the battery. This battery is complemented by an intelligent energy management system that significantly extends the time of use. 243 hours of waiting time. The above data were obtained under laboratory conditions, only serve as a reference. Band technologies 2G: GSM 850MHz, GSM 900MHz, 1800MHz, GSM 1900MHz. 3G: WCDMA B1 2100MHz, WCDMA B8 900MHz. 4G LTE: FDD B1 2100MHz, FDD B20 800MHz, FDD B3 1800MHz, FDD B7 2600MHz, FDD B8 900MHz. Wireless connectivity 4G, A-GPS, Bluetooth 4.0, GPS, WiFi. Interfaces Dual nano SIM card slot and micro SD memory card, 3.5mm audio port, charging port. Main camera: 20.0MP + 2.0 MP. features Autofocus, touch focus, continuous shooting, exposure compensation, face detection, HDR, ISO setting, “Smart Beauty”, brightness enhancement, color intensity, clarity and dynamic range, manual focus, autoflash, shutter release automatic and digital zoom. includes 1x CUBOT P20 Phablet. CUBOT P20 Phablet: Where to buy it? Currently, the CUBOT P20 Phablet Smartphone is available on the Gearbest online store for a price of $129.99 (€112.85), if you wish to purchase it you can go to the page using the link that we provide below.